Coming off a positive note at the Ontario University Athetics (OUA) Fall Invitational competition, the Warriors had been training hard and were confident that they could improve their individual scores and overall placements at the Winter Invitational. On Jan. 29 and Jan. 30, the University of Toronto hosted the annual OUA Figure Skating Winter Invitational at the Scotiabank Pond in North York, Ontario. In attendance were 10 teams from universities that are part of OUA and McGill University. At the competiton, each team, sends 1-4 skaters to compete in each of the 14 different events over the course of the two days and depending on the placement of the skater(s) in each event, they can earn points for their team. On day one of the competition, UW student, Jocelyn Wong competed in the Women’s Gold Freeskate event. She skated a beautiful solo to Josh Groban’s “You Raise Me Up,” placing fourth, which earned three points for the Waterloo Warriors. By the end of day one of the competition, the Toronto Varsity Blues were leading with 57 points, the Western Mustangs were second with 35 points, and the McMaster Mauraders were third with 26 points. On day two, the Warriors picked up the pace, with Deanna Gooden and Charlotte Hings earning three points in Star 10 Dance. Emily Steis and Hannah Chartier in Intermediate Similar Pairs and Darshak Patel in Men’s Freeskate earned each one point for the team. The competition ended with the Synchronized Skating event, which was the event that the Warriors have been training extremely hard for throughout the season. 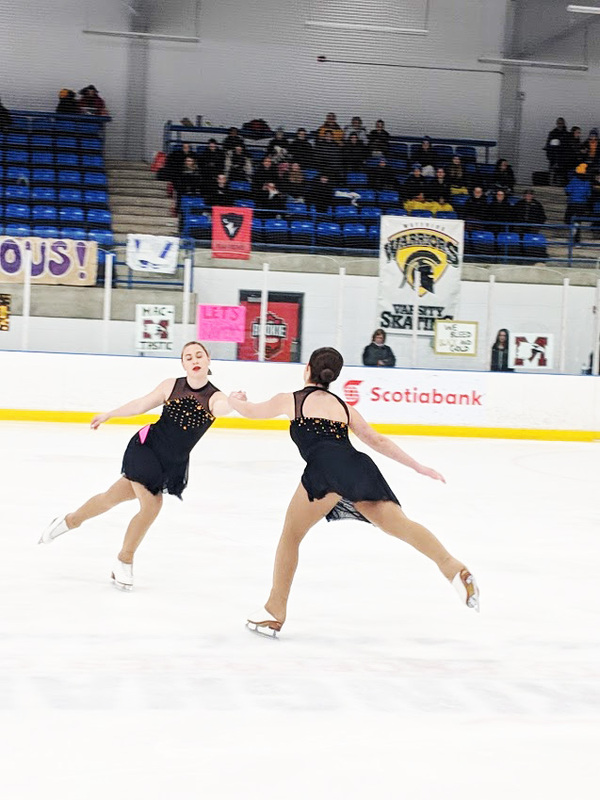 With a strong training foundation and high team spirit, the Warriors skated a fun and entertaining program to Queen’s “Bohemian Rhapsody.” The Toronto Varsity Blues continued to go undefeated, winning the competition with an overall score of 100 points. The Western Mustangs were second with 79 points and the Queen’s Gaels slid into third with 41 points.